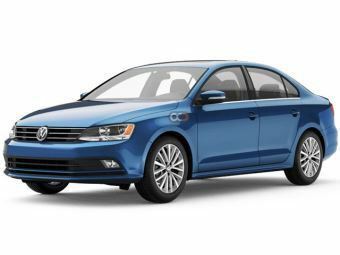 The Volkswagen Jetta received a facelift in 2015. It comes in two options which are a 2.0-litre 4-cylinder engine and a 2.5-litre 5-cylinder motor. It also offers three trim levels, named S for the 2.0, and SE and SEL for the 2.5. The base S model comes with standard features like keyless entry, 4-speaker CD/MP3/AUX stereo, power windows, electric mirrors, cloth upholstery and 16-inch steel wheels with hubcaps. The extra features with SE are 8-speakers, 6.5-inch colour touch screen, leather seats, 17-inch alloy wheels, automatic a/c, steering-wheel buttons, cruise control, fog lamps, sunroof, alarm system, rear camera and parking sensors. The top SEL comes with ESP, hill-hold control, xenon headlamps, rear LED lights, front fog lights with cornering lights. AllJetta models come with ABS, six airbags and auto hazard lights as standard. Overall a perfect car that offers style and comfort with an overall postive rating for UAE roads. Fair Deal Rent A Car LLC is a RTA-approved car rental company in Dubai. It is one of the better known rent-a-car companies in the UAE for cost effective car rental services. The shop timing of mentioned below.